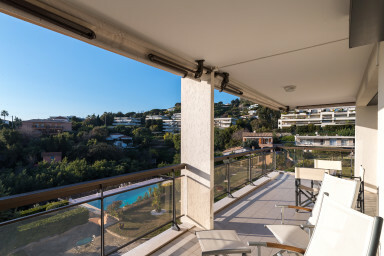 Charming 105m ² apartment, located in the heart of Cannes. It offers all the comfort for an exceptional stay in Cannes. Ideal for delegates (30 minutes walk from the Palais des Festivals) there are many buses that go to the Palais and tourists (10 minutes walk from the beach). The living room / dining room with a flat screen and a sea view . You have access to a huge 30m² terrace south exposed. And you have access to the swimming-pool. There is a bedroom with a double bed (160X200) with air conditionner and terrace. The second room has two single beds (90 X 200) with air conditionner and terrace. An huge kitchen fully equipped with everything you need to prepare your favorite dishes : oven, fridge, Nespresso, kettle, toaster, dishwasher, wine cave. You can use a parking place.